Finding smaller breweries off the beaten path is one of the driving forces behind the Liquid Alchemy blog. 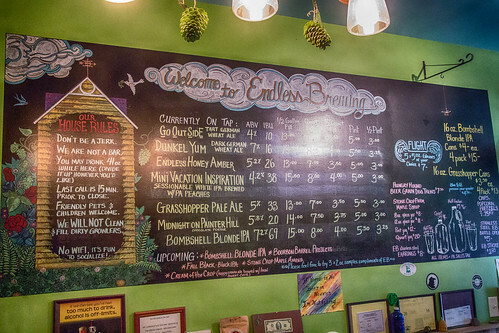 While looking for new places to visit, we discovered Endless Brewing in Montrose, PA, just thirty minutes south of Binghamton, NY. After a short drive through a picturesque area of Pennsylvania, we soon arrived at the brewery, ready to taste and learn about the many beers that Endless Brewing produces. 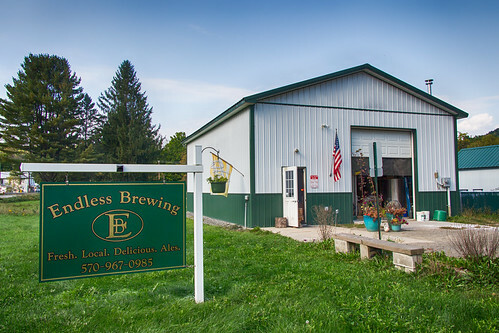 Endless Brewing is located in a small inconspicuous aluminum barn surrounded by farmland and forests. 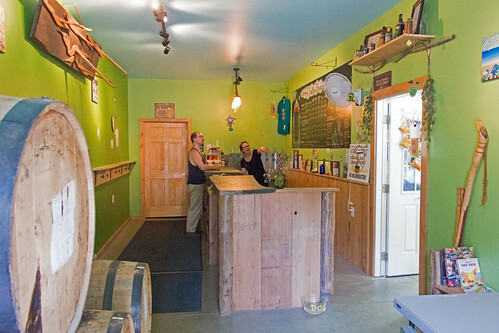 Half the building is devoted to the tasting room, charmingly painted in a lovely shade of green and mostly taken up by a very long wooden tasting bar. We were met by Morgan Kelly, one of the co-owners of the brewery. She was happy to answer our questions while we went through a tasting of the beers currently on tap. Starts off traditionally like a Gose but seems hoppier. Also, could use more salt to stay true to style. Very malty and traditional. A delicious dark beer. Great chocolate roast aroma, medium body finished with more notes of toast and chocolate. Sweet but well balanced. I really love how the hops and honey work together here. Bright hop aroma, lots of citrus notes too. Very hop forward Pale Ale. The peach is super subtle but still detectable. This made for a great sessionable IPA. Rich and quite thick with beautiful tropical notes. Almost seems like a double IPA. I was excited by the diversity of beer currently on the menu at Endless Brewing. 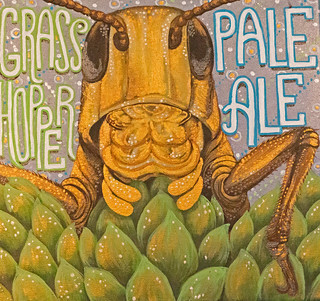 From IPA’s to a Porter, the brewery is trying to cover the gamut. While the Gose didn’t quite work for me, I was impressed to see them crafting this unique style and hope they continue producing one-offs like this. I also love the use of local ingredients such as the honey in the Amber and the peaches in the white IPA. My favorites were the Midnight on Painter Hill porter and the Bombshell Blonde IPA. Both were extremely flavorful, true to style, and had mouth-pleasing finishes. The Bombshell Blonde is their most popular offering and is considered the brewery’s flagship beer. 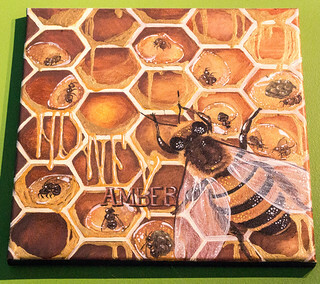 Their second most popular beer is the Honey Amber; another excellent choice and a great showcase for the local honey. Morgan and her partner Jon Winans started the brewery in June of 2012. They had homebrewed together for many years and when Jon was laid off from his previous career they decided to open the brewery. Almost five years later, they are brewing on a seven barrel system and are ready to move into a bigger space. Up until June of last year, they couldn’t even sell pints as they only had a manufacturer’s license. Today though, you can purchase flights, pints, and growler fills. Due to the size of the building, there is limited space inside to relax and enjoy a pint. However, tables outside are available to be used in warmer weather. Morgan and Jon prefer hoppy beers, but are equal opportunity brewers and try to make a range that appeals to everyone. They also love making up the names for all their beers and try to be as creative as possible, often relating names back to local landmarks such as Painter Hill. The name of the brewery actually has two meanings. One is obvious as they are located within the Endless Mountain region of Pennsylvania. “Endless” is also how they feel about the brewing process as they find themselves brewing multiple times a week in a never-ending cycle. 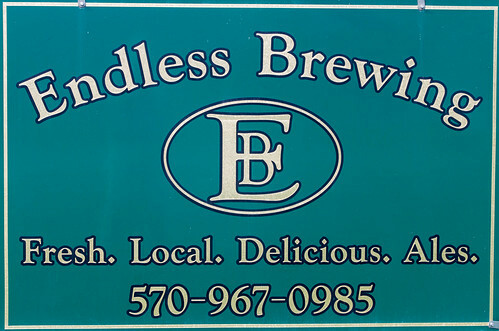 Endless Brewing considers itself to be an asset to the community and wants to give back as much as possible. Spent grain is used by nearby farms, as well as by a person who makes dog treats from them. They are canning some of their beers and self-distribute to local bars and restaurants. At the brewery, Morgan and Jon have set a lot of self-imposed rules to keep things small. For example, there is no wifi available and they limit the number of drinks a person can buy while there. They want people to talk to each other, and not be stuck staring at their phones, reviving the idea of old time taverns. I think this is a great concept but personally feel they will need more table space in a larger location to truly make that work. While in the tasting room, be sure to check out some of the small details around you such as the bar itself. Originally, Morgan and Jon wanted to use an old farmhouse for the brewery but it was a structural nightmare. So, they saved many of the beams and boards before razing the building and used them to construct the bar. The stones on top of the bar came from property owned by Jon’s grandfather on nearby Painter Hill. 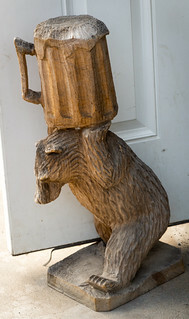 The tap handles are made by a local artist who also sells bottle openers with a similar design. I appreciated the paintings on the wall created by local artist Jessica Pride, each representing a different label for their beers. The selection of artwork is rotated out periodically. Local maple syrup and t-shirts are available for sale at the brewery as well. Morgan and Jon are working with barrel aging and have 8 Woodford Reserve barrels on site, some of which were almost ready for release when I visited. 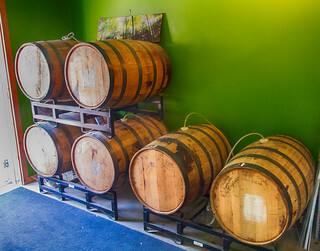 I am excited to see how their barrel aged creations come out and will certainly be returning to investigate. 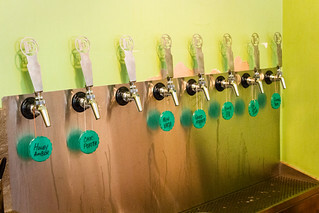 Currently 75 – 85% of their business consists of growler fills. I can imagine that, if they expand their site, more people will want to come there just to relax with their friends over a pint or two of fresh beer. Morgan would love to see them open a brewpub but Jon isn’t quite ready to make that leap yet as he likes things kept smaller and less complicated. 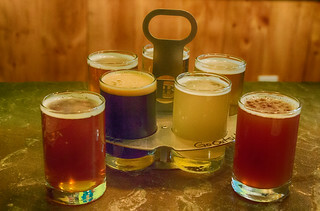 Even with Endless Brewing’s off the radar status, it is well worth visiting if you are in the area. 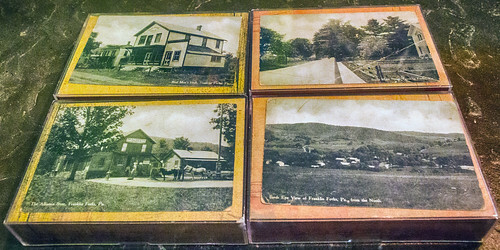 The brewery, as well as many beautiful state parks, is located less than half an hour from Binghamton. Get off the beaten path and visit Morgan and Jon to try their diverse selection of beer. Salt Springs State Park is located just a mile away from Endless Brewing. It is home to massive Hemlock trees, some over 300 years old. Twelve miles of hiking trails meander through the park, with many scenic views of the creek, waterfalls, and old growth forests. The next time I visit the brewery, I will be sure to save a few hours to hike some of the trails and photograph the waterfalls at this nearby park. 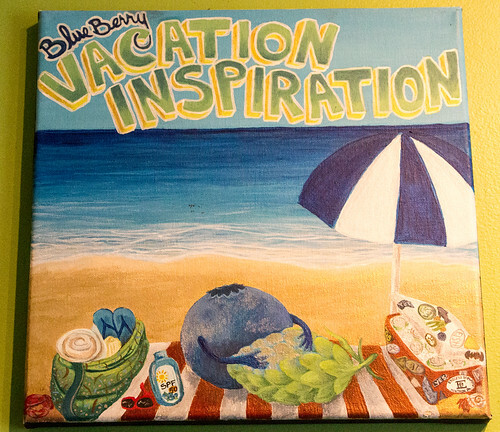 This entry was posted in Breweries and tagged Brewery, Pennsylvania by tanders1. Bookmark the permalink.